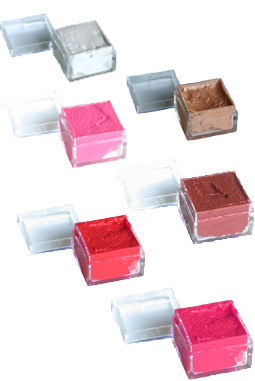 With CUBED CREAM BLUSH you can make yourself look as if you are naturally blushing or a porcelain doll. The pigments are strong and pure which means you can apply them lightly in order to have an extremely natural look or you can apply them more heavily for a more noticeable change. And one of my favorite things about the product is how good each color looks on so many different skin types. For example the Black Russian makes pale blonds look as if they just got off the ski slopes and darker skinned African American women look as if they had spent time on the beach! From top to bottom, criss cross. Vodka Face Highlighter This light shimmery cream is perfect for highlighting parts of your face to create contour or for just giving yourself an ethereal glow Usage Tip: See "Glamourizing Techniques" in "MAKEUP the Art of Beauty"
Black Russian (Red/brown) (Our most popular color) A deep reddish brown. good on any skin tone. Bloody Mary (Bright red) Bright red. Don't be scared! Use a miniscule dot and its very soft, slightly more very dramatic.